Treat your loved one to this Ruby Wedding cake - perfect for that special occasion! Only the finest handpicked cheeses for you and your guests. The Ruby Wedding Cake serves approximately 65 people. 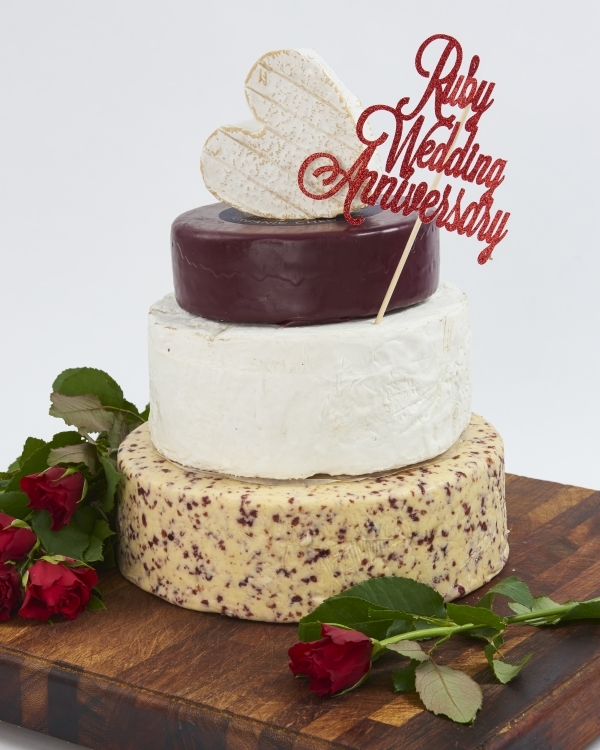 Along with every anniversary cake we send out from our 'Set Range' we will send a postcard with a photo of the cake and on the reverse there will be full descriptions of each of the cheeses you will be serving to your guests. Please Note: The anniversary cake comes undecorated for you to stack and decorate as you wish. Look at our website gallery for some examples. If you would prefer to taste before you buy you can purchase a sample box of all the cheeses that go to make up The Ruby Wedding Celebration Cheese Cake.